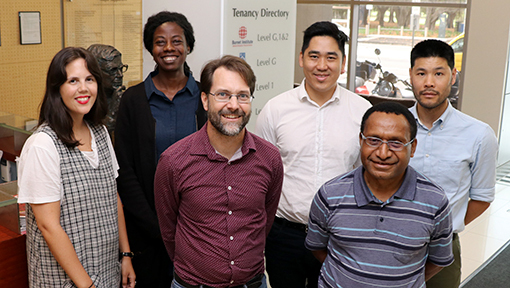 Over the past week, Burnet Institute has been pleased to host a visit from Dr Gibson Pawape, the recently appointed Senior Specialist Medical Officer at Daru General Hospital, Western Province, Papua New Guinea (PNG). Since 2014, Burnet has been a partner in the multi-stakeholder response to a major outbreak of drug-resistant Tuberculosis (DR-TB) in Western Province. Reducing the impact of Drug-Resistant Tuberculosis (RID-TB) is a project funded by the Australian Aid program via the Department of Foreign Affairs and Trade (DFAT). In this project, Burnet continues to work in close partnership with Daru General Hospital, the Provincial Health Office, World Vision and the World Health Organization to combat the epidemic. Dr Pawape brings a breadth of experience as he returns to his first home of PNG after working in Australia in hospital and rural settings across all states over the past 14 years. Prior to that he trained and worked in PNG as a physician and worked as the Provincial Health Advisor in Enga Province from 1999-2004. “It’s been eye-opening to see the foundation of Burnet in Melbourne, and I am very impressed with what I learned, and meeting all the incredibly friendly and very skilled scientists and physicians,” Dr Pawape said. The Burnet team looks forward to continuing to work closely with Dr Pawape to continue to strengthen the systems for patient-centred care, and to implement outbreak response measures with the shared goal of putting an end to the epidemic.